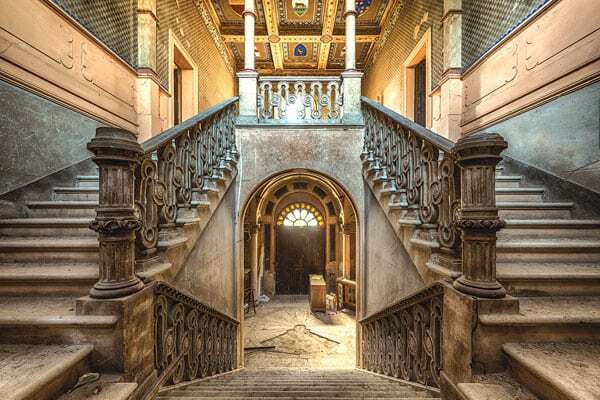 This feature comes from the fall 2018 edition of the Nonprofit Quarterly. It was first published online on September 13, 2018. 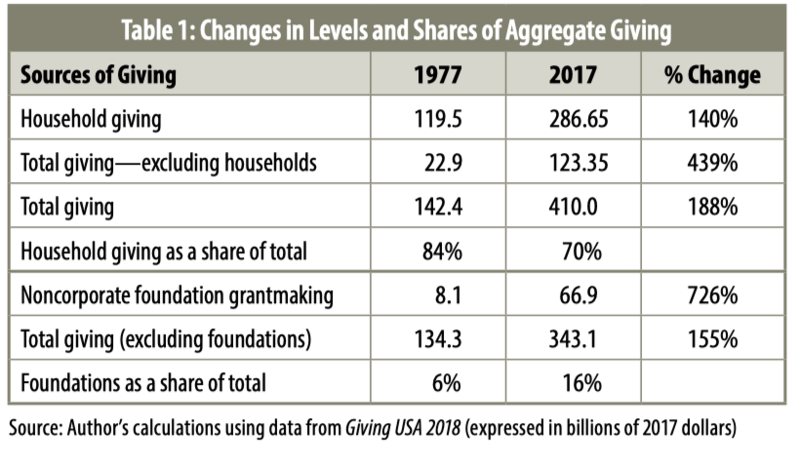 We know from Giving USA 2018 that both total giving and household giving have grown to record levels.2 For example, as Table 1 shows, total giving in 2017 was $410 billion, which is almost triple the amount that total giving was forty years ago, even in inflation-adjusted dollars (i.e., $142.4 billion in 1977). Similarly, total household giving last year was $286.65 billion, which is 2.4 times now what it was forty years ago, after adjusting for inflation ($119.5 billion in 1977). While household giving has grown at an impressive rate, its growth has not nearly kept pace with the growth in total giving, which manifests itself most clearly in the decline of household giving as a share of total giving over the last forty years: 84 percent versus 70 percent. More conspicuously, household giving has grown an impressive 140 percent over the last forty years, but the other sources of giving (corporations, bequests, and foundations) collectively have grown 439 percent over the last forty years, which reflects an increasingly important role for the “large” donors. However, it is important to note that this increase in total giving and in total household giving is occurring in spite of the decline in the percentage of households that have donated at all between 2000 (the first year for which we have these data) and 2014 (the most recent year for which we have these data). As Table 2 shows, the share of households donating at all dropped from approximately two-thirds in the early 2000s to just over half in 2014. It is likely that the drop following the Great Recession is linked to the remaining hardships. If one loses one’s job or consumes one’s lifetime’s savings during a period of economic distress, then philanthropic giving likely will not be viable. The graph also delineates the decline in the shares of the population that donate to religious charities and to all secular charities combined. It should be noted that both types of philanthropic giving follow the same pattern as overall giving, but the giving to religion drops more precipitously. These numbers are based on the Indiana University Lilly Family School of Philanthropy’s Philanthropy Panel Study (PPS), which is a module of the University of Michigan’s Panel Study of Income Dynamics (PSID), a biennial survey of the same households over time.3 The PSID is the largest (13,472 households) and longest running (since 1968) panel study in the world. It is widely considered to be the “gold standard” of social science research. Following the same households over time (rather than examining a series of different cross-sectional samples over time) allows us to measure the effects of changes in the economy or of public policies on philanthropy much more precisely. 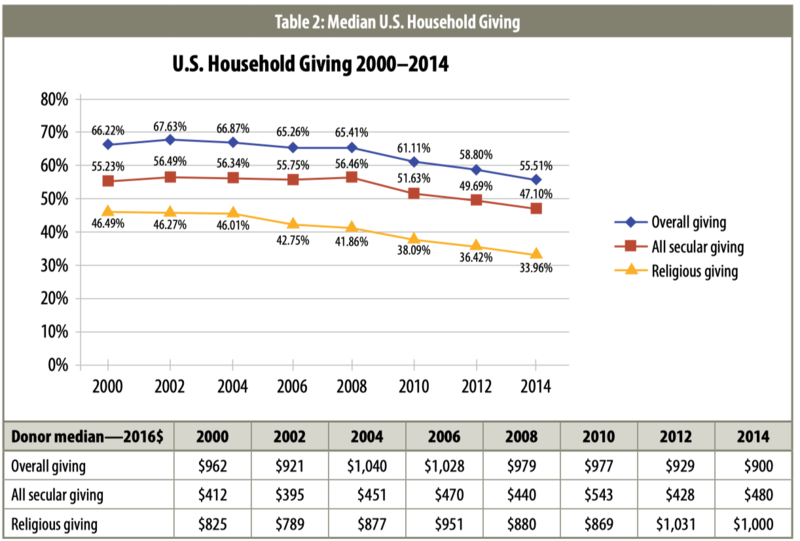 We can see from Table 2 that the median total giving per donor household has also declined modestly over the last fourteen years. The decrease in overall giving, as well as religious giving and all secular giving, would be more conspicuous if we looked at all households—but this table includes only donors, so as smaller donors drop out altogether, the median donor values seem better. If we look at this same time period and adjust for inflation (to make a more apples-to-apples comparison), total household giving (according to Giving USA 2018) increased 5.4 percent. There is one inevitable conclusion from these trends: if total household giving is growing but the share of donor households is declining, and the typical (median) amounts donated per donor household are declining (all after adjusting for inflation), then gifts at the higher end (minimally greater than the median) are driving the increases in total household giving. We must ask the following questions: Are these trends good signals for philanthropy specifically and society more generally? If not, what can be done to remedy these circumstances? Not only can we infer that the growth in household giving is resulting from increased giving at the “high” end of the income and giving range, there are also several pieces of data that are consistent with that inference. Together, these pieces create a pattern of data that seems to “triangulate to the truth” (as we say in research methods courses). First, as Table 3 demonstrates, over twenty-two years (1993 to 2015, the most recent data available from the IRS for these purposes), total itemized giving by households earning more than $1 million per year (adjusted gross income) has grown almost tenfold, from $7 billion in 1993 to $66 billion in 2015. (These differences are not adjusted for inflation, so some of the growth is caused by inflation and some is attributable to the increase in the number of households earning $1 million or more annually.) Some of the growth over time is also due to itemizing households of all income levels (column 1) and individuals and households with AGIs greater than $1 million per year (column 2) giving more to charities. Second, the table shows that the share of total itemized giving by those earning $1 million or more per year has nearly tripled over the same time period: it grew from 10.3 percent in 1993 to 29.8 percent in 2015. This suggests that not only are those earning a million dollars or more annually giving more in absolute terms, but also their share of all itemized giving has grown dramatically. 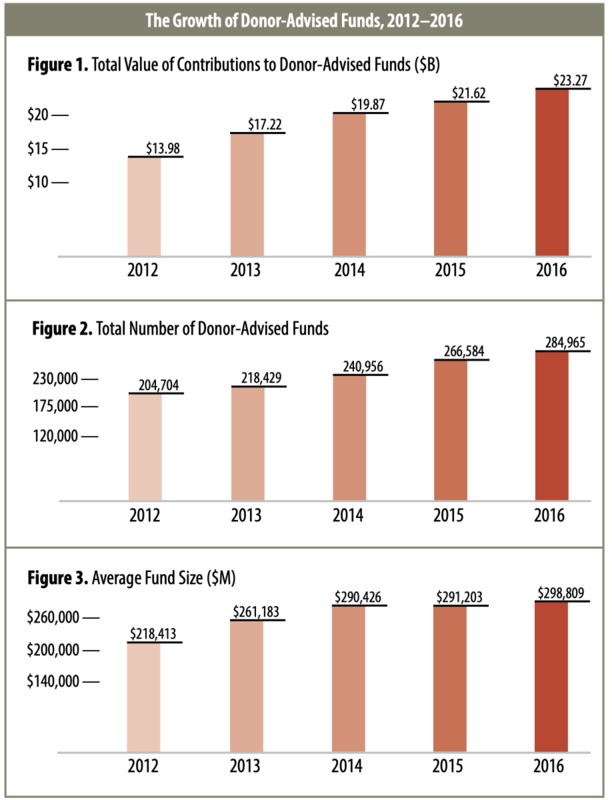 Additional evidence of the growth in giving at the high end of income and wealth is from data on donor-advised funds (DAFs) and foundations. The dramatic increase in both the number of DAFs and the accelerating growth of the total value of contributions to DAFs is consistent with growth in giving at the high end (see Figure 1 through Figure 3, below). While some DAF providers are increasingly lowering their entry thresholds, DAFs remain an opportunity for organizing one’s giving that most lower- to middle-income households would (could?) not consider. For example, as we see in Figure 3, the average DAF account in 2016 was nearly $300,000—not your typical donor. Noncorporate foundation grantmaking is another proxy for the impact of high-income households. While some foundations are called family foundations and others may be called private or independent foundations, virtually all are created by one or two generations of the same family. According to Giving USA 2018, noncorporate foundation grantmaking has grown more than eightfold in the last forty years (726 percent; see Table 1, top of article). This growth rate is 4.7 times that of the rest of total giving. 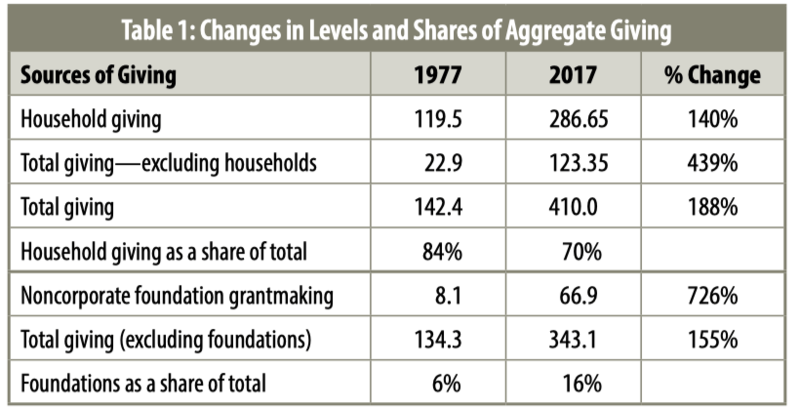 The share of total giving from noncorporate foundation grantmaking has almost tripled over the last forty years (6 percent in 1977, compared to 16 percent in 2017). This strongly suggests a disproportionately large effect of donors from the high(est) ends of the income and wealth strata. We see further evidence of the impact of giving at the high end from the Lilly Family School of Philanthropy’s Million Dollar List (MDL), a list of all publicly reported gifts of a million dollars or more.5 The original Million Dollar List began in 1963 with the work of Arthur C. Frantzreb (19202004), who gifted the MDL to the then Center on Philanthropy at Indiana University (now the Lilly Family School of Philanthropy) in 2000. Historically, in each presidential election cycle for which there are data, more people donated to charities than voted for president (see Table 4; note that we do not yet have the giving participation rates at the household level for 2016). 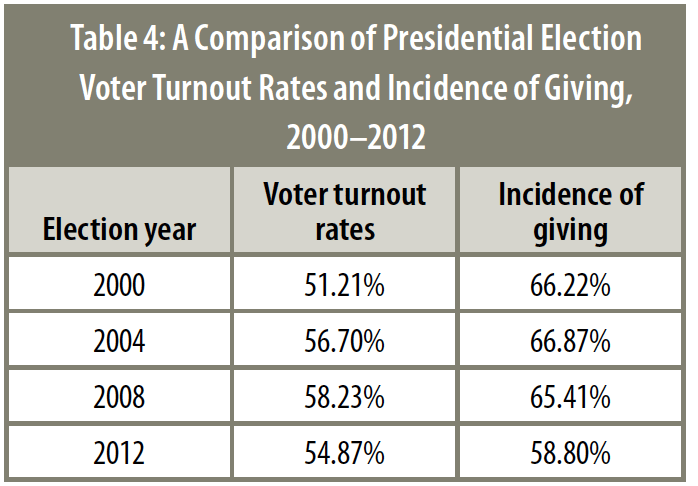 The trend over the last decade for which data are available reflects a slight increase in the voter turnout rates and a meaningful decline in the incidence of giving (donating at all). While this “voter-donor gap” has been getting smaller over the past four presidential election cycles (for which we have data), it still demonstrates that for many people, philanthropy is an important part of their “voice” in their efforts to help build a civil society. 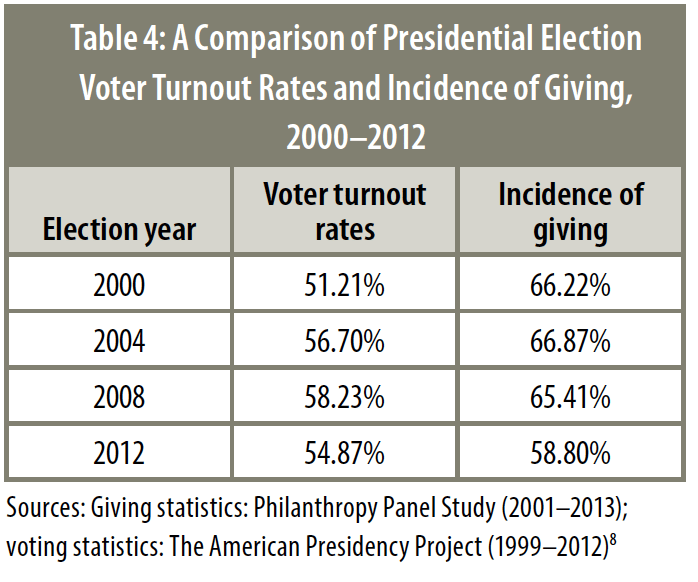 In fact, for our society overall, it consistently looks like giving is more important than voting for president. If it is an important part of our American democracy that people are expressing their “voice” through philanthropy, then, on a philosophical level, should we not honor and respect that voice by allowing all households at all income and wealth levels to deduct their charitable gifts? We might question whether that voice is effective. We might ask, do the “small” gifts even matter? But observationally, we see that many charities rely on a large number of “small” gifts, and virtually all charities try to raise funds across the entire spectrum of donors and gift sizes. Research done independently by the American Enterprise Institute (AEI) modeling the effects of the final tax bill on giving in 2018 estimated that a universal deduction (without a floor or ceiling) would increase household giving by $21.5 billion in 2018.10 It also estimated that the final tax bill (without the universal charitable deduction) would decrease giving by $17.2 billion (or 4.0 percent), with most of the effect (82.5 percent) coming from the near doubling of the standard deduction. Their methods and some assumptions are slightly different from ours, but their results parallel ours and are of similar magnitudes. Both studies show that the empirical impact of the universal deduction is not trivial. Over the past fourteen years (for which we have data), we have seen a decline in the share of Americans who are donating at all, and a decline in the amounts donated by the typical American household. Conversely, we have seen the growth of aggregate household giving and total giving overall. Evidence presented here suggests that this growth at the aggregate levels is being fueled by gifts from donors who are at the higher ends of the income (and presumably wealth) distribution. Implementation of a universal deduction for charitable contributions is important both empirically and symbolically, now more than ever. The empirical effects are now more important, given that very few households are expected to be itemizers under the new tax law. Instead, according to recent estimates from AEI, “among the 8.6 million taxpayers with an AGI greater than $202,000, the number who claim the standard deduction is expected to increase from approximately 550,000 to 3.3 million.”11 These households likely were in the 39.6 percent top marginal tax bracket. If they become non-itemizers, their after-tax cost of donating $100 will increase from $60.40 (under the old tax law) to the full $100 (under the new tax law). This represents a 65.6 percent price increase in the cost of making a donation. It’s important to stress that people give for many different reasons, and it is not rational in an economic sense to give solely or primarily because of the tax effects (i.e., it’s not rational in the sense that one would never give at all if one only cared about the after-tax consequences for one’s income). However, empirically, we know that some people will change their behaviors somewhat when faced with a 66 percent price increase: some may elect not to give at all, and others may reduce their giving. It’s also likely that many donors will be unaffected—but historically, the “price” of giving has an impact on enough households that changes in the tax code do affect the total amounts donated. While the universal deduction is a part of our “recent” history (1982–1986), it was not part of the final tax bill passed last year. There are two proposals in play now to reinstate the universal deduction. First, a proposal from Rep. Mark Walker (R-NC) and Sen. James Lankford (R-OK) would allow non-itemizers to deduct their charitable deductions, but with a limit of one-third of the value of the standard deduction. This would likely increase the amounts donated by non-itemizers and would reduce the fiscal burden on federal tax revenues—but it would also reduce the amounts donated when compared to an unlimited universal deduction. AEI’s results (June 2018) modeled something close to this (but not exactly this) proposal and estimated that the effects on the deficit would be greater than the effects on giving, so such a limit may appeal to budget hawks. Second, a proposal from Rep. Chris Smith (R-NJ) would create a universal charitable deduction without a limit, which would be better for philanthropy overall. This leaves us at an important inflection point in the balance for charities, philanthropy, and society. Establishing a universal deduction for charitable giving is a step in the right direction for both empirical and philosophical reasons. It would increase charitable giving by households by a significant amount; and, in a meaningful manner, it would more closely reflect our nation’s democratic principles. While more people give to charity than vote for president, it is important that our tax code reinforce this philanthropic and fiscal linchpin of our democracy by democratizing philanthropy with the implementation of a universal deduction for charitable contributions. Author’s note: I thank Xiaoyun Wang, Jon Bergdoll, and Xiao (Jimmy) Han (all at the Lilly Family School of Philanthropy) for their excellent research assistance. The views expressed are mine and may not represent those of the others helping me gather the data: the Lilly Family School of Philanthropy, IUPUI, and Indiana University. Patrick M. Rooney, “Why Congress should let everyone deduct charitable gifts from their taxes,” The Conversation, June 27, 2017 (updated September 28, 2017). Indiana University Lilly Family School of Philanthropy, Giving USA 2018: The Annual Report on Philanthropy for the Year 2017 (Chicago: Giving USA Foundation, 2018). Survey Research Center, Institute for Social Research, University of Michigan, Panel Study of Income Dynamics (data file and codebook), 2001–2013. Internal Revenue Service, SOI Tax Stats—Individual Statistical Tables by Size of Adjusted Gross Income, 1993–2015. Indiana University Lilly Family School of Philanthropy, Million Dollar List (data file), 2018. Calculations are by the author. National Philanthropic Trust, 2017 Donor-Advised Fund Report (Jenkintown, PA: National Philanthropic Trust, 2017). Panel Study of Income Dynamics; The American Presidency Project, Voter Turnout in Presidential Elections: 1828–2012 (Santa Barbara, CA: UC Santa Barbara, 2018). Note that our research was based on proposed legislation introduced by former (retired) Rep. Dave Camp (R-MI) during the previous Congress. The final tax bill passed in December 2017 was similar in many ways to the Camp proposal, but the Camp proposal had a more modest cut in the tax rates and a smaller increase in the standard deduction. We used the Camp proposal as the baseline for our research then, because there was no clear indication of what would or would not be in the final bill, and there were shifting announcements about what might be in the final bill up until the time it actually passed. So, we used a baseline that we expected to be close to the final bill and would not be subject to changes. Alex Brill and Derrick Choe, “Charitable Giving and the Tax Cuts and Jobs Act,” AEI Economic Perspectives, June 18, 2018. How about the nonprofit and philanthropic sectors come together to do something affirmative and resist the destructive, inequitable, and undemocratic trends that are occurring in individual giving and our national tax code? Can we just get that done?